"The International Court of Justice and Human Rights"
"Does the United Nations Have A Judicial System?" Given our many prior posts about her, Dame Rosalyn Higgins hardly needs an introduction on this blog. She made legal history by becoming the first woman to be elected as a judge of the International Court of Justice. Higgins’ tenure at the United Nation’s highest judicial body will be remembered for a number of important rulings, including the historic ruling on Serbia’s genocide during the Bosnian war and her Joint Separate Opinion on universal jurisdiction in the Yerodia case. Prior to becoming a member of the Court, she was professor of international law at the University of London from 1981–95, and earlier held positions at the Royal Institute of International Affairs, the London School of Economics, and the University of Kent. In 1986, she had become Queen’s Counsel followed, three years later, by the position of Bencher of the Inner Temple. Judge Higgins has practiced public international law and petroleum law in the English Court and before various international tribunals and held offices in many professional organizations. She has served as honorary vice president of the American Society of International Law and is currently a vice president of the British Institute of International and Comparative Law. 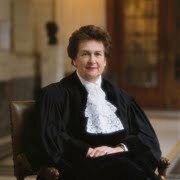 Judge Higgins received her bachelor’s degree in 1959 from Girton College and a doctorate in 1962 from Yale University. She was also a Harkness Fellow from 1959 to 1961. She has published various works and articles on international legal theory, United Nations law, the use of force, state and diplomatic immunities, human rights, and international petroleum law. Hope to see you there! (Picture at left includes my colleague Jiri Toman, an old friend of Judge Higgins).